The ISON comet, which reached the perihelion on 28th November 2013, was destroyed by the sun. It was a disappointment for many a science lover but it also shows the enormous complexity that the sky, our universal laboratory can display as the universal laboratory before us. Comet ISON was discovered on 21st June 2012 by the Russian astronomical group and the name ISON was given, after the group that discovered it. Right from the beginning it was understood that it was a large comet, it would come very close to the sun. 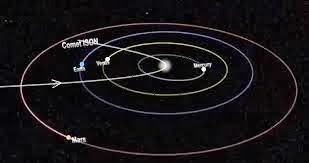 Its closest approach to the sun, called its perihelion, would be only 1100000 kilometers away from the surface of the sun. The astronomers thus surmised that the comet would become extremely bright and would be visible form the earth for several months, perhaps up to February 2014. Its path was accurately calculated and the perihelion was predicted to be on 28.11.2013, and it did reach its perihelion on the predicted day. Being large and sungrazing also raised doubts about the survival of the comet. Since it is large its matter may not be very dense. Also if it would go too close to the sun, would it not get evaporated by the heat of the sun? These were the questions which everyone pondered about. Let us see why these questions are important. The material of the comet is a solid object in the core. The core may be about 10 kms in diameter. Thus a comet, if it be close enough to the sun, i.e. about 300 million kilometers away from us, as was with the ISON, will look extremely small as if a we are seeing the two headlights of a car from a distance of one lakh kilometers. When it approaches the sun the solid crust begins to vaporize due to the sun's intense heat. The vaporizing matter then surrounds the solid core, creating a fuzzy mixture of gas and dust. This is called the coma. The coma could be several thousand to million kilometers in diameter, large enough to be visible from the earth. As the comet approaches the sun even closer, more and more matter gushes out of it. Sun's rays push this matter away from the sun. They now form a stream like object, pointing away from the sun, getting wider as farther it goes from the core. This is the tail. This tail can be several million kilometers in length and is thus clearly visible in most cases. The tail too is full of gas and dust, more and more dust condenses as the matter moves farther away from the comet's core, as the material goes to regions, which are cooler. From observations it was calculated that the ISON would be visible to us from November 2013 to February 2014. But the imponderable question was: what happens to it as it approaches the sun. Will the sun wipe it off by rapid evaporation? The other question was: will the comet simply split into fragments due to tidal forces arising out of the sun's gravitation? Comets are rather small objects. The ISON, tiny though it may be, weighed 10,000 trillion kilograms, i.e. a billionth of the weight of the earth. At the perihelion (closest approach to the sun) it was estimated that it would lose 60 kgs of water and 51,000 kgs of dust per minute. The intriguing point was that it had so less water and so much of dust compared to many other comets! Comets also have carbon monoxide, carbon dioxide, methane (marsh gas), hydrocyanic acid etc. Since the comet was to pass by the earth at a minimum distance of 150 million kilometres, these gases from it will be too depleted when they reach us, to cause any harmful effect here. On making these calculations one finds that even with the comet splitting there would be no deleterious effects on earth. This was also seen with the ISON. But comets do look weird objects for the layperson. They appear to come from nowhere and grow and then develop and finally vanish into nowhere. “The earth hath bubbles, as the water has”, said Shakespeare. Comets are not bubbles but they appear and vanish, “as breath into the wind”. But with time we know where they come from and whether and when they will revisit us, e.g. We know that they come from the Oort cloud which is 1 light year ( 94608000 lakh kilometers) away from us. Comets are named after their discoverers. But there is one comet, the Halley's comet that was first seen many centuries before Halley. It got named after Halley because Halley followed it trajectory very carefully and through these studies, the Newton's laws of gravitation cam to be known to us. Here we follow this interesting history. In Halley's time Europe and Britain in particular, witnessed great social changes. Merchantile capital was growing and trade multiplied. These trading interests gave support to astronomy, as stars were the guides for the sea fairing traders. The British East India Company was set up in 1600, (under the royal decree). It offered a job to Halley. In 1677 he was sent to the island of St. Helena, in the Southern hemisphere, (to which Napoleon would finally be banished in 1815 and lived there till his death in 1821) for creating accurate star charts for navigation. Halley spent about a year at Sr. Helena for about a year and came back to London with a catalogue of 300 stars. He discussed the data with fellow scientists at the Royal Society, the most important amongst them being Robert Hooke. About sevety years ago, between 1605 and 1615, working diligently with the observations of Tycho Brahe, Johaan Kepler had discovered the laws of planetary motion. On trying to look at his own observations from St. Helena and trying to explain them on the basis of Kepler's laws , Halley got a clue about the inverse square law of gravitation. But he was not sure. In 1684, Halley went to Cambridge to meet Newton and seek his help on this. Newton astonished Halley by saying that he had already solved the problem few years ago but had not preserved the papers and was not eager to redo the proofs. But thanks to Halley's patient persuasions, an unwilling Newton finally published the proof in the Principia, in 1687. For this publication, Halley had spent his own money. Newton's gravitation not only gave the gravitational force to be attractive inverse square in nature but also to be universal, i.e. the same laws operate in heaven and earth, as Galileo had first said about the nature of the physical laws. Kepler's laws followed from Newton's gravitation. But Halley's life did not go smoothly, even after these contributions. In 1691 he applied for the post of the Sullivan Professor of Astronomy in Oxford but did not get it because of his atheism, even Newton supported his rival candidate! This job he got ten years alter after his tormentor, the Archbishop of Canterbury, had died. Halley got interested in comets of 1680, 1681 and 1682, during his visit to France. About a century ago, Tycho Brahe had observed the position of the moon and the 1577 comet (not Halley's comet) from two different points, several hundred kilometres apart. He found that as the observer's location was moved the moon's shift was more than that of the comet. This established that comets were farther away than the moon. But Tycho's illustrious, one time assistant, Johannes Kepler had made an error in judging the paths of comets. Kepler, who had discovered that planets move in elliptic orbits around the sun, found the paths of comets to be straight. This was because Kepler had observed very distant comets, so the curvature in their paths could not be clearly seen. Halley found that the 1682 comet did not move on a straight path. It roughly followed the paths of the 1607 and 1531 comets, yet did not match their paths exactly. There was still another problem. While planetary orbits were seen to be remarkably periodic, the intervals between the visits of the 1456, 1378, 1301 comets was 76-77 years, on an average, but were not identical. Comets, because of their unpredictability and peculiar appearance, like “sword hanging over the city” or like a “dragon in the sky”were held with awe and fear. In Shakespeare's Julius Caesar we hear, “When beggars die, there are no comets seen: the heavens blaze forth the death of princes.” And further, in Henry VI, we are told that comets are capable of “importing change of time and states.” . Halley's predictions did not create any interest in his life time. The interest returned in 1757. Halley had died in 1742 (his last act was to drink a glass of wine, sitting in his observatory, few minutes before he passed away at the age of 86). Charles Messier in France first saw the comet's return in November 1758 but waited for further confirmation. On the Christmas night of 1758, a Saxon farmer, Johaan Palitsz saw it and announced the confirmation of Halley's prediction: Newton stood vindicated. More would follow, like William Herschel's discovery (based on observations from 1779 onwards) that every member of a stellar binary moves around its companion, is the same way as predicted by the laws of Kepler. So, gravitation is universal. New standards were thus being set for the exactness of the exact sciences! And Halley was right. Now we know of more than hundred comets with period less than 200 years and of about 50 comets with period less than ten years. The shortest period is seen in the Encke comet, being 1209 days. Thus, it has returned about fifteen times in the last fifty years. This gives us enough opportunity to test Kepler's laws and Newton's theory of gravitation, over and over again. The orbits of artificial satellites that we launch are calculated in terms of Newton's laws. There is no evidence to question Newton's laws, unless we travel with speeds very close to that of light or we are in the vicinity of very massive objects. But there are many things that we have discovered since the time of Newton and Halley, particularly about the composition and evolution of comets. Astronomy is now not merely celestial mechanics but involves the entire gamut of physics. But we know much more about comets than Newton and Halley knew. They knew about their orbits but we also know as to what they are made of. How do we know all these?-one may ask. Spectroscopic methods, (essentially analysis of colours and their relative brightness) known since the nineteenth century, tell us about the chemical compositions of objects, their temperature and pressure. From these studies, it was known that the fate of the ISON depends largely on the orbit it follows, i.e. on how close it gets to the sun: and really it fell into its deathtrap from which there was no escape. Though Halley's prediction did not get the attention in his time its later visits were widely covered by the press. The 1986 visit was shown in the visual media and was accompanied by mass viewing. Very few have seen its two visits. But those who did, told the press in 1986, about their past experience in 1910. One such person was Dr. Salim Ali (1896-1987), the renowned ornithologist. My colleague, Dr. Vasundhara Raju, a cometary physicist herself, recalls her late father-in-law's thrill on learning about Halley's comet's 1986 visit, since he had also seen it in 1910! One of the persons whose life had a great overlap with Halley's comet was Mark Twain. “I came with the Halley's comet of 1835. It is coming again next year and I expect to go out with it.” Mark Twain had said in 1909. Irreverent of authority, he continued “It will be greatest disappointment of my life if I don't go out with Halley's comet. The Almighty has said no doubt, “Now, here are two unaccountable freaks; they came in together, they must go out together.””Mark Twain did not live with that disappointment. He passed away, just after the day Halley's comet reached its perihelion, in its 1910 visit. A great coincidence indeed! Zamindar: Can you see, how hot the weather has become? Khneturam: Oh! It is unbearable, as if being baked on fire! Pundit: Yes, the other day, we could see the tail of the comet from our place. Duliram: Whose tail it was, I wonder? Duliram: Worms in the betel leaves, the Allahabad Exhibition. Pundit: But from things I have heard, this part about worms in betel leaves is not correct. Khneturam: No, it is absolutely true. Our Doctor Nandalal has seen for himself that people are dying as soon as they taste these betel leaves. Zamindar: Oh, ho, ho! In that case it must be true. Khneturam: And our English doctors from Calcutta have said, they are very poisonous. Duliram: Yes, I have seen they have white tails. But whose tails those were, I wonder. It was conjectured that since the comet was large and came very close to the sun, the tidal forces from the sun, the solar wind etc. would blow away the matter and the intense heat would evaporate the core of the comet. However, if it did survive there would be chance to observe it for about two months. The interested public under the banner of Eyes on ISON started preparing for this for the last six months, having conducted several workshops in different parts of the country to prepare for mass viewing. Excitement grew as the perihelion approached. Our astrophotographer friend in the Eyes on ISON campaign, Ajay Talwar, camped in Devasthal in Uttarakhand and wrote to us on 7th November, 2013 that he had sighted the ISON and sent the photographs. Congrats.! we at Punjab have the naked -eye view of the long awaited celestial guest, ISON comet . It was about 7:00 am .i was at roof of my home since 5am today near Sangrur (Latitude 30.25 N,longitude :about 76E). A call at7:01 from a young student from Delhi made me more watchful. And i located the tailed object in eastern direction at an altitude of 15-20degree It kept stationary throughout the obsv. period of about 15 min .the tail was distinctively a bit broad and appeared double -stripped,with an angular expanse of about 5-6degrees. The tail was parallel to horizon and pointed away from sun .The tail went on fading with the rise of sun above horizon . I made one dozen calls to other science friends .5of them immediately came out and observed the same . Two friends from Malout &Ropar towns of Punjab intimated this sight . My own son ,aged 23,was witness to my observation . His excitement was obvious . But this hope, however, did not fructify. The comet went close to the sun but did not come out of it. I had stationed at Devasthal for 3 mornings to watch ISON, but was unable to see it. Instead I photographed Comet Livejoy which is quite bright these days. Please see attached images. The comet ISON is certainly dead. What it has left behind is a trail of gas and dust and tremendous enthusiasm in us. In its lifetime, it gave us very interesting time. What we see now is the comet Lovejoy. The joy of “Universalizing the Universe”: will live with us. It will be our first step for universalizing quality education and scientific temper, a universal demand for all. Dedication: The article is dedicated to the memory of Dr. Narandra Dabholkar, the news about whose murder reached us when the Eyes on ISON workshop was being conducted in Bangalore, on 20th August 2013. Hope, this article will help the cause for which Dr. Dabholkar gave his life. Many details about ISON and the campaign can be accessed at: www.eyesonison.net.